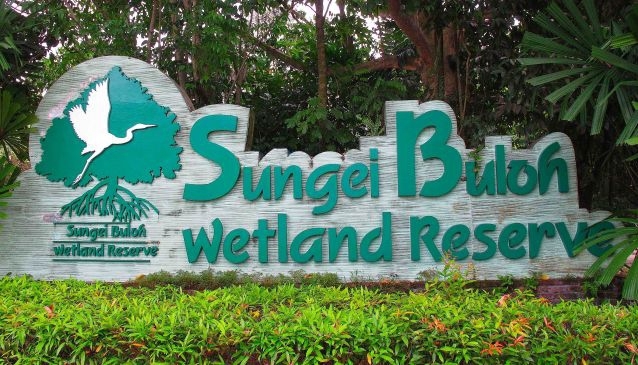 The Sungei Buloh Wetland Reserve was initiated in 1986 by a group of avid birdwatchers and later designated as a nature park by the government. The wetland site is a unique place and home to many different species of fauna and flora. The Mangroves house wildlife like mudskippers, crabs, shellfish, snakes, spiders, herons, kingfishers, sunbirds and of course the impressive monitor lizards that you find nearly everywhere throughout the park. During the September to March season, you can also observe migratory birds such as the egrets, sandpipers and plovers. The park offers a variety of different trails, depending on the time available. However, we recommend that you set at least 2 hours aside for the shortest trail to allow some time to observe the outstanding fauna and flora. All trails are well maintained and suitable for the entire family. Bikes are not allowed and prams might be difficult unless they are designed for nature trails and have large wheels. The exhibition at the entrance explains the wildlife and offers very good and interesting information. The restaurant that used to be located at the entrance has ceased operations so we recommend that you pack your own food. There are drinking water fountains to refill your water bottles and a vending machine for drinks and sodas. Allow enough time to walk slowly so you can discover more wildlife. Crocodiles can be spotted easier during low tide. Be as quiet as possible and bring binoculars if you have. The admisson fee is SGD 1 per adult and SGD 0.50 per child. Check our Events Page for free guided tours, usually offered every Saturday at 9.30am.